Thank you to the homeowners for giving us this stunning project in Forest Hill. The couples' amazing eye for design teamed with our decorating skills has made for a beautiful home. This was a complete re-decoration from top to bottom in a characterful Victorian terraced house with beautiful original features. Our team transformed the living room, dining room, hallway, kitchen/diner, and three bedrooms using Farrow & Ball colours: Manor House Gray No. 265, Hague Blue No. 30 and Light Gray No. 17 (all in Estate Emulsion) and Brinjal No. 222 in modern emulsion, plus Dulux Trade colours: Linen White, Rum Caramel 5, Grey Wisp and Sapphire Salute. We're delighted that this project was featured in The Decorator - The Painting & Decorating Association's magazine. The paint colour is absolutely perfect!! I really appreciate you taking the time to ensure that it's the exact colour I asked for. It has worked fantastically and I absolutely love the grey! Thanks very much for your professional work and your attention to detail in carrying out this project. A family in Lewisham wanted their Victorian terraced home bathroom transformed. We created this stunning monochromatic colour scheme using Tikkurila Optiva (a Finnish brand of paint) matched to Little Green’s Lamp Black No. 228. The result: the most instagram-able bathroom ever! Being based in an architecturally-rich area of South East London, we often get to see inside some fantastic homes. This Blackheath “T2 Span House” was no exception: one of 44 houses situated in The Keep, it is a 1950's design classic. The residents, a European couple on assignment in London, had impeccable taste to match the modernist aesthetic of their home. The Henry Fix team completed a simple lounge refresh using a muted, Scandinavian-inspired colour palette: Farrow & Ball’s Hardwick White No. 5 Estate Emulsion paired with a pure white trim. In the hallway, we used the neutral-toned Shaded White No. 201 in Modern Emulsion. Eric Lyons, the consultant architect for Span Developments Limited, once said: “The test of good housing is not whether it can be built easily, but whether it can be lived in easily”. One might say the same of good decorating and whether that can be lived with easily. We enjoy jobs like this where the homeowners really let their personalities shine through. A pop-art hung hallway led to this lounge in Peckham which we transformed from a plain white box with Cole & Son’s Prism Geometric II wide-width wallpaper. The home was a new-build apartment with good quality walls, but we had to contend with eight sockets, a radiator and awkwardly placed door frame (in the height of summer!). The kaleidoscopic pinks, oranges, purples, greens and blues create a real statement for this contemporary interior. In the main bedroom (pictured right), we applied Patternbooth's "Stitch" apricot line wallpaper as another statement wall. 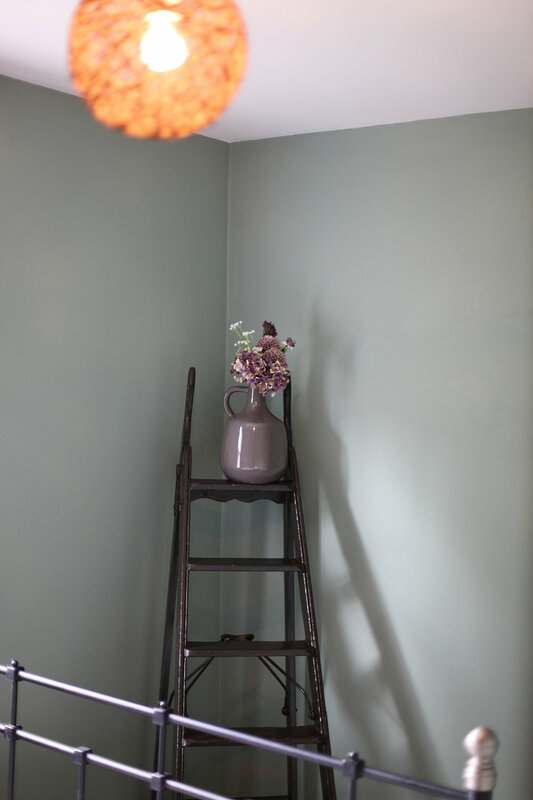 We transformed this cosy guest bedroom using Dulux Trade Sage Green on the walls in a flat finish. A contemporary colour choice - we're seeing a lot more green in homes at the moment - this sage hue pairs well with the dusty pink accents. This Brockley loft conversion used all the wallpapers! Pictured left is a 4-metre drop statement wall in the stairwell using Ferm Living's "WallSmart" new generation of non-woven paper in a design called "Half Moon". Pictured right is Galerie's Regency Stripe wallpaper which we hung horizontally for a boy’s bedroom. We used Marimekko Design House's vinyl Bo Boo print on an adjacent wall in the boy's bedroom and Scion's "Mr Fox" print for the girl's bedroom. We love these kinds of projects: a completely empty new loft conversion waiting to be given some colour and life. By the time our part starts, the homeowner is usually very keen to get the project completed after weeks of building work and disruption. It's our job to get things completed as quickly as possible (while never compromising quality). We'll put the finishing touches to the homeowner's vision so they can start enjoying their new space. Note: if you're considering having your loft conversion professionally decorated be sure to enquire early. Don't run out of budget or time at the end of the project. Good decorators will need to be booked in advance. Give your loft conversion the finish it deserves! This warehouse-style apartment in Southwark had a clinical all-white decor, but the homeowner decided to go bold with Farrow & Ball’s Hague Blue No. 30. 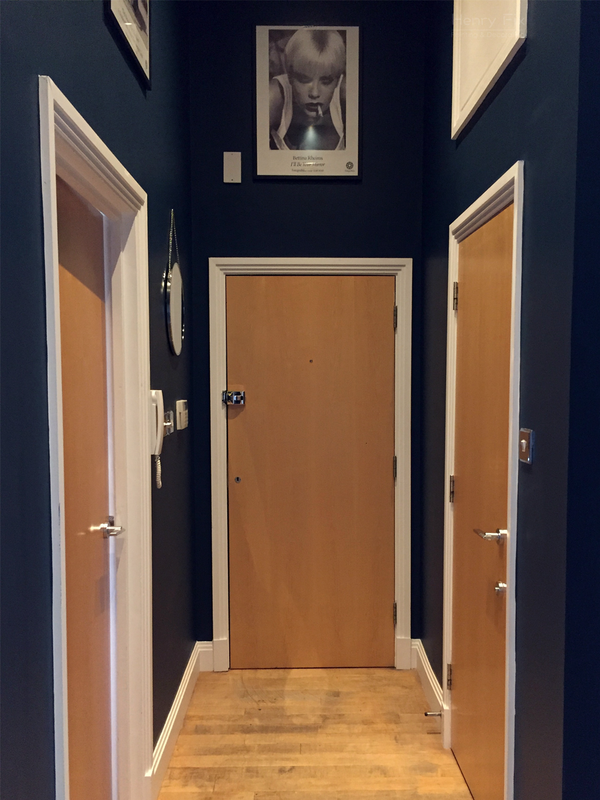 Our decorating team used modern emulsion for its more durable properties in a high-traffic area such as a hallway. So often, people are scared of colour, especially in modern white-washed apartments, so we're really happy that this homeowner stayed brave and saw her creative vision through. We love the finished look which sets off the artwork really well. After we’d stripped the wallpapered ceiling of this 1930’s terraced home in Auckland Hill, we painted the through-lounge/dining room in Valspar's Summer Grey with a crisp white trim (Dulux Trade's Swedish White). The homeowners later invited us back to create a nursery for their new arrival and we used the vintage print "Abracazoo" by Sanderson for the walls. It's always an extra honour to return to homes we have worked in. A lot of our work is contemporary and minimal, but that doesn’t mean we shy away from the traditional. This grand Edwardian family terraced home in Greenwich needed an update in-keeping with its history. The homeowner requested a Sanderson statement wallpaper (a Fabienne Solaine print) and we paired it with a complementary Farrow & Ball colour on the walls and Shaded White No. 201 Estate Eggshell for the woodwork, sliding sash windows and cupboards, which we finished flawlessly by hand.